Who would shoot a defenseless sea lion pup! 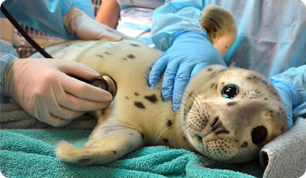 This young sea lion pup was found in Monterey, CA, May 18, 2011 with a gunshot wound to his face. X-rays show multiple metal fragments in this sea lion pup's head. Sadly, a fair number of sea lions are rescued by the Center with signs of previous gunshot wounds that have since healed over. In 2010, the Center admitted 9 patients with gunshot wounds - most recently a large male sea lion named Silent Knightwho had been shot in the face and is now permanently blind. In 2009, the number of patients admitted with gunshot wounds was a staggering 19! It is illegal to harm or harass a marine mammal under the 1972 marine mammal protection act. Violators can be prosecuted and fines and even jail time imposed for convictions.